Genuine goodness. We have pre-steamed our Basmati ensuring that the grains never stick. Naturally sun-kissed, matured grains for exceptional taste. Broken grains removed to ensure a light, fluffy texture. Each batch is purity tested to remove inferior grains. Our signature rice grains are parboiled so they will never stick. Gluten free. There are many different ways to cook rice - this one is really simple: 1. 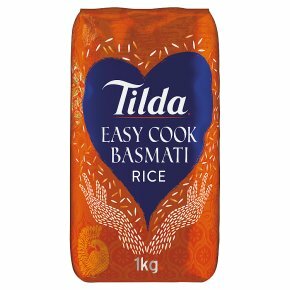 Add 60g of Basmati per person to a large pan of boiling water. 2. Cook on a medium heat for 15 minutes. 3. Drain well, cover and let stand for 3 minutes then lightly fork through the grains and serve.